This week for Virtual Book Club Summer Camp we are featuring activities you can do "In the garden." If you're not yet subscribed to our weekly camp emails, go here to sign up. Today our VBC Summer Camp featured post can be found over at The Educators' Spin On It. 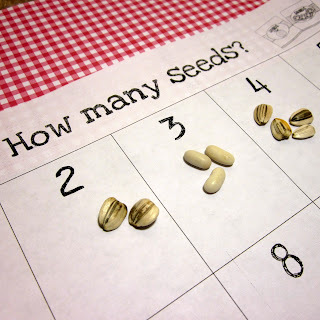 Kim is sharing some fun ways to do math with seeds... inspired by Eric Carle's book The Tiny Seed. We also did some creating inspired by The Tiny Seed during our Mommy & Me Book Club this week. My friend Chrissie read The Tiny Seed aloud to our kids and then she gave them materials to create their own flowers using seeds! Use the glue to draw your flower or plant onto your paper. 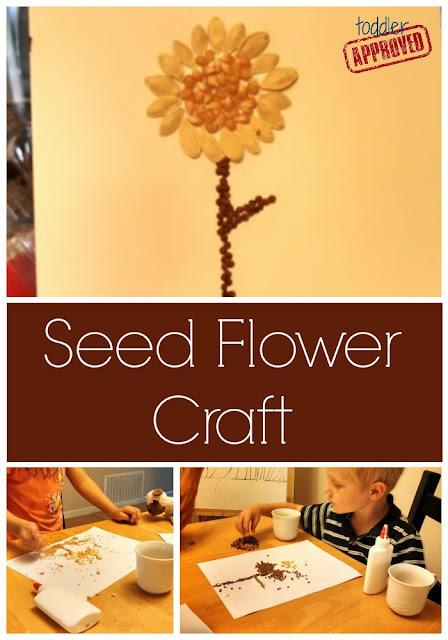 Sprinkle or place seeds on top of the glue to create your flower. Let the glue dry and then display your pretty flower picture! Our kids LOVED to use the tiniest seeds and then drop them everywhere... and occasionally putting them in the glue! I think Chrissie will be picking up seeds in her dining room for awhile. The tiniest ones reminded me of glitter! The kids were enthralled with the various sizes of seeds and had a great time creating their flower masterpieces. Some made flowers, some made grass, some made things that didn't resemble anything in particular... but that wasn't the point! We also reviewed the basic parts of a flower while creating and reading our book. Do you have a Tiny Seed inspired craft you've done? What other ways can you play and create with seeds? Come back tomorrow to see the other "in the garden" activities we are sharing and also head over to Rainy Day Mum for our featured Thursday activity. Don't forget to enter our "In the Garden" giveaways from Green Kid Crafts and NurtureStore as well. Go here for more details!